December 4, 2012 by Laurie 159 Comments This post may contain affiliate links, which means if you click on a link and purchase something, I may earn a small commission (at no additional cost to you.) See my disclosure policy HERE. Notes: I just made it using regular salted butter and it was fine. Also, be sure to put a larger pan underneath your pan in case any of the butter/margarine mixture seeps over – you'll want to watch it closely while in the oven so that it doesn't melt over the edges of your pan. Okay, let me just preface this post by saying that's the most horrible name for a recipe, but it's the only way to describe just how good and addictive this stuff is. . . I promise, you will LOVE every bite! Line 12x17 cookie sheet with foil and spray well with cooking spray. Layer the saltine crackers on top of the foil. Heat butter and sugar on stovetop and heat until gently boiling, stirring constantly. Bake 5-6 minutes in oven. Remove pan from oven and let cool 3 minutes, then sprinkle chocolate chips evenly over brown sugar mixture. Break into bite-sized pieces and serve. . . yum, store covered in refrigerator. Do you have a favorite Christmas treat that you love to make? Leave a comment sharing the recipe, and feel free to link to it on your blog or another page and we might sample it here! Love shopping Black Friday? Download your free Ultimate Black Friday Cheat Sheet 2016 and don't miss a deal. I think I’m going to have to try this! Looks delicious! It could be. But I bet it was a cloudy day when you tried the recipe. A cloudless day makes for better fudge, brittle, etc…less humidity. My Dad taught me this trick many many years ago. Well this explains the horrid fail I committed tonight. I wonder if it is because the stoneware takes a long time to cool but it didn’t even cool over night? Stoneware retains heat longer than metal cookie sheets. We’re you cooling them in the pan? I line mine with silicone baking mats instead of foil. Then I’d slide it onto the pampered chef cooling rack. If that still doesn’t work, maybe your sugar and butter isn’t being cooked long enough. I’ve made this but with the miniature pretzels instead of crackers and got rave reviews from friends topped with crushed nuts of your choosing. I have also made these using Ritz crackers… I know we have had lots of sales on those and they work great too! I have made a similar recipe before. You can make it with graham crackers also, but we have taste tested and can’t really tell much of a difference (I know that’s hard to believe). My recipe also adds some pecans to the top after you get the chocolate to melt. They are really great. It was the only thing people wanted me to bring to parties for quite a while. Think I will make some too. Ritz crackers now come with a chocolate covering (top and bottom). You’re right–they taste like choc-covered graham crackers. The heat from the toffee mixture will melt them within a few minutes after you spread them – hope that helps Cathy! Is there any reason you can’t mix the chocolate chips in with the toffee mixture and stir to melt. Then pour all of it over the crackers? Because if you add chocolate to the toffee and mix it, it will not harden. When I just made them, be sure to place a piece of foil over it, after you sprinkle the chips on and wait 3 min. That is the perfect amount of time for the chips to melt. I had to keep putting the pan in the freezer, at 20 min. intervals for about 3 times (1 hour total), before the chocolate was hardened enough. I don’t believe I let the butter and sugar boil long enough though, stayed sort of soft. How far in advance can this be made? Does it get soggy if made too far in advance? I’ve had this. It really is YUM! I’m making it this weekend! This is my go-to Christmas recipe! It tastes really good frozen and right out of the freezer too. It is cheap to make and super quick for a large batch. WIN WIN! Don’t leave the pan in more than 90 seconds when you put it back on with chocolate chips..they won’t “melt” down, they soften and need to be spread. I learned this the hard way and burnt the whole pan the 1rst time. I also top with almond slivers for decoration and crunch, so good! Just about a 1/4 cup after the chocolate, if there are no allergies. NOTE: I have also made a few pans and froze it and it’s good for weeks, in a pinch. Doesn’t go soggy or stale. I can’t wait to try this for our Christmas party this weekend. Will dark brown sugar work? It’s what I have on hand. Do you have any tricks when spreading the chocolate to keep the crackers from moving? I have a cookie sheet with edges, but it wasn’t big enough. Thank you for the recipe and your time. I used one with a rim so I’m not sure what else would work. The brown sugar mixture should have soidified some to help too though! I’ve used a different recipe without success in the past. This recipe works out much better. I have also used some graham crackers, cinnamon graham crackers and some crushed candy canes on top. All turned out well. Next time, I will try it with Ritz. So glad it worked for you Liz! I usuall make another recipe using only 24 crackers and I like it much better. 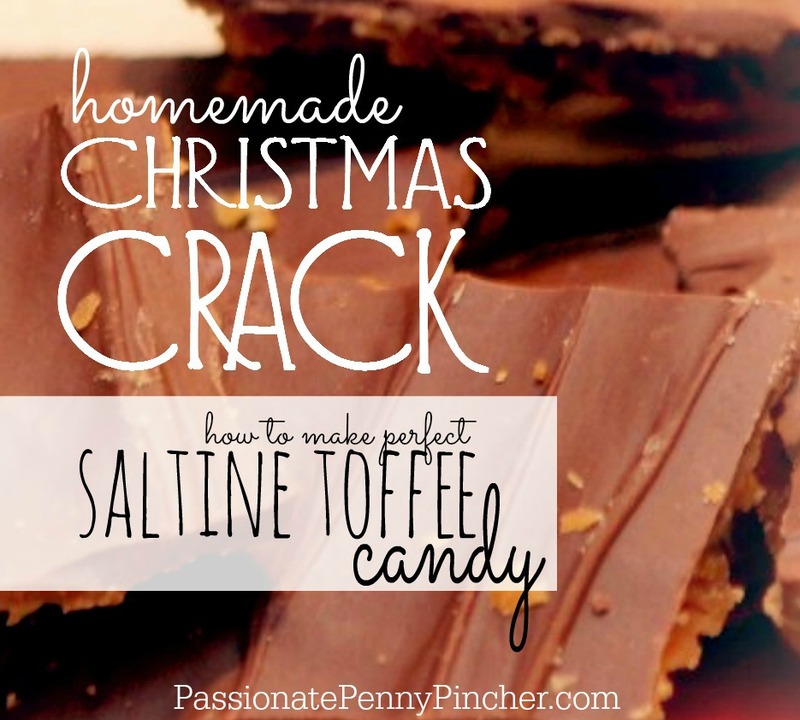 I found this recipe has a little toffee and lots of cracker. 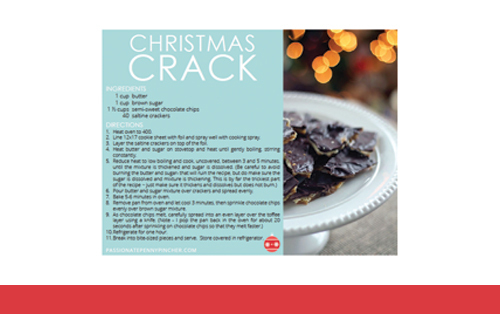 I tried this recipe today and while the Christmas Crack does taste delicious, I would advise to NOT use a cookie tray. This ended up being a disaster! Toffee all over the oven. Definitely use a rimmed cookie sheet. We normally line it with parchment paper (instead of foil sprayed with cooking spray). Pinned. I made this about 20 years ago, and it was such a huge hit. I got out of the habit of making it, but I’m glad I re-found the recipe. After spreading the chocolate, while it was still warm, I sprinkled Heath English Toffee Bits over the top. I know it's not Christmas, but I make this Saltine Crack for Wednesday night Church sometimes cause it's so easy. Now when people ask for the recipe, I'll just tell them to look at my FB page. is there any other option for the crackers? The only option I can think of is to use Graham Crackers – I’ve heard they work too! Hope that helps. Try the Keebler Club crackers – those rock! Will have to try those – thanks for the tip Jerry! I haven’t done it yet but I’m going to try making them with waffle pretzel squares. I’ve made these using various kinds of crushed nuts as a top layer (pecans, walnuts, almonds…) but my absolute favorite is crushed red and green peppermint candies. I love chocolate and mint together and the red, white, and green gives it a festive holiday presentation! I don't use a cookie sheet. I use a glass baking dish. Keeps the liquid in. Also I tried this with milk chocolate chips and found it to be a bit too sweet (who knew there was such a thing). Question for you – this gets so melty at room temperature. Not that it lasts too long but any tips for serving this? A girlfriend of mine made this for us at work and topped it with SKOR bits! Amazing! I’ve heard of – but ever had or made – this candy, but I’m so making it this year! I love toffee and this recipe sounds simple and delicious. I’m sure it will be a crowd pleaser. You’ll love it Angela – it’s soooo good! It should firm up, but does take awhile – I usually put it in the fridge to make it firm up sooner! Hope that helps Angela! Should I use dark or lite brown sugar? Does it matter? I usually use dark brown sugar – hope that helps! Mine was a disaster it never harden on the bottom the syrup is so gooey any suggestions? I am so disappointed I tried putting it in the refrigerator try putting it in the freezer? What could I have done wrong? I’m not sure Diana ~ so wish I could help more! If anyone has any suggestions please let us know. The recipe I have for this has you melt the butter (make sure it is real butter, not reduced fat, fake something else) first in the saucepan before adding the brown sugar. Then, bring it to a boil and THEN boil for 3 whole minutes. My guess is perhaps you didn’t use butter or it didn’t boil quite long enough. I actually like this recipe because you don’t have know about “soft crack stage” or measure temperature or anything to get it right (in my experience). Also, we have to keep this is in the refrigerator here in the South or the chocolate layer melts all over your fingers while eating it. You probably didn’t cook the butter-sugar mixture long enough. I just finished my second batch and have to do everything not to keep sampling! Added pecans to one batch and almonds to the other. So easy and super yummy. Thanks for sharing! Also, tonight I let it sit for a few minutes before spreading the chocolate (so they were good and warm), then I popped them in the oven that was cooling off for about 45 seconds to help speed the warming process. That might help Gina! I spread crackers and then melt almond bark in the microwave pour it all over the crackers and sprinkle with what ever you like I used crushed candy canes, it’s quick and easy no melting butter and sugar. I mix brown sugar and butter in the microwave until it bubbles. I pour that mixture over the crackers and bake at 325 for 12 min. Take out and pour bag of mini semi sweet chips on crackers. Then a bag of health bits o brickle. Turn off oven and let set for 20 min. Take out and use spatula to smear chocolate around. Put in freezer for about 25 min and take out and turn upside down into another cookie sheet. Take a mallet and bear it up in size you want. I use heavy duty no stick foil. Sounds like your spreader could have been wet. All it takes is a drop of water to ruin melted chocolate. Just curious… Why semi sweet choc chips? Have u used milk choc? I always use milk in place of semi sweet because I don’t care for semi sweet. Would it be too sweet? I’ve always used semisweet, but some folks have told me they use milk chocolate and it’s turned out well, so if you like those better I think it would work out perfectly. Hope that helps! To make them more festive for Christmas you can also sprinkle with crushed peperment candy after choc. Melts….. I can’t wait to try this recipe. I have eaten it before but never tried making it. Also, you asked for other Christmas tradition recipes and I always make WHITE TRASH. It is super easy and quick. I always have trouble waiting for it to cool before eating it. I am adding the recipe below. W/ CEREAL MIX. SPREAD OUT ON WAX PAPER TO COOL. This is similar to a Passover recipe we have made, using Matzohs instead of crackers. They would make it easier, as each matzoh is about 8 x 10 inches and won’t move around in the pan. As far as storing them is concerned, they won’t last long enough to store, but you could break up the matzohs into smaller pieces and store it in an airtight container (that’s why you kept all those cookie tins last Christmas). My mom has made this for us for 30 years. It’s always good and great for a chocolate craving in a short period of time. She use to sprinkle chopped nuts on top of the melted chocolate. It is incredible with almonds. Used unsalted crackers to cut down on the salt intake since I use salted butter. crushed walnuts sprinkled over the melted chocolate works too. Butter and sugar make the toffee. Just make sure you boil the correct amount of time. Just made this tonight and it is yummy but its a bit chewy . Did I not cook the butter and sugar long enough you think ? First time to make toffee .. My husband said it was good other than sticking to his teeth . Just tried,not sure what happened butter and sugar never got thickened! Crackers aren’t soggy so I just used melted chocolate and put in fridge. Guess I will see if it works! I make this and use butterscotch Moses instead of chocolate and add toffee bits. It’s a winner no matter how you make it! I can’t get the chocolate chips to melt!!! I plan to try this with pretzels instead of the crackers. I have made this recipe for over 30 years. It was called FOOL’s TOFFEE. The only difference is that I made mine using no FOIL, butter the jelly roll pan and place crackers directly on the pan. After you spread the softened chocolate, you sprinkle 1 cup of pecan CHIPS over everything and chill before breaking into pieces. It freezes well, if it lasts that long. Store in a Vacuum sealed container and refrigerate, and they will keep indefinitely. My mother would laugh at me when I told her I had to put the container in the basement refrigerator to keep them out of my sight. Oh so good. Can you use Blue Bonnet? The regular kind? I use white sugar, a throw away aluminum cookie sheet, spay the spatula with Pam before spreading chocolate chips, I freeze for about 10 minutes then I cut them with a pizza cutter or large chef knife. I’ve topped with peanuts, pretzels and whatever I have around. Trader Joe’s has gluten-free pretzels. My neighbor made these one year. Instead of semi sweet chocolate, she used white choc chips & cut up craisins. Best thing ever! Thanks for sharing the recipe! So many variations of yumminess! Can’t wait to try making them! I have this recipe with finely chopped almonds on top. It called Mock Almond Roca. A favorite here. My mother used to make that recipe and I am 75 so it has been around for a long time. It was one of my favorites! this is best if yoiu crush candy cane and sprinkle on top.. oh man!!! I have made this and actually melted the choc chips in glass bowl in microwave and poured on and evened out. Worked Great – Just my trick I ave also done this by doing a DOUBLE Layer . I made this today and used peanut butter chips, OMG YUMMY!!! That is my favorite. Chocolate is great too but oh my the peanut butter is super delicious. 🙂 Enjoy! Just made this using brown sugar substitute and sugar free chocolate wafers melted on the top. Way less sugar and still all the taste. Yum! I tried making this tonight and it didn’t work out so well. :/ I couldn’t get my brown sugar to dissolve and it never mixed with the butter…as I could have strained off the butter and been left with a bunch of brown sugar…..???? I did melt the butter first and let it get hot in the saucepan first then added the brown sugar. Could that have been it? I cooked it long enough, long enough for me to smell the transformation to toffee smell but it never mixed and then it finally burned because I cooked it so long. Any help would be appreciated. Thanks! I tried this recipe. Sorry but we didnt like it. Not at all!! I was glad I cut the recipe in half so I didn’t waste all these delicious ingredients. Like real “crack”, I will not have one bit of trouble staying far away from this recipe again! I like making things shared on FB- this goes into the “worst ever” folder. No offense meant to the creator- I imagine they have made other things better.than this. I um HOPE they have gotten to experience recipes better than this one anyway! Going to make this for an office party this week. …curious can I melt the chocolate separately and then spread over the cooled toffee? Have this recipe from many years ago. It is written out on a paper hand towel by one of my elderly cancer patients. I’m a retired Nurse & this lovely little lady spent many hours on the Cancer unit. She would always bring in this candy for the staff. Her instructions are, after boiling for 3 minutes, test the syrup by dropping a small amount into a cup with a small amount of cool water, if a small soft ball forms, the syrup is ready to spread on top of the saline crackers. If no soft ball forms after 3 minutes of boiling, continue to boil & test again after each minute until soft ball forms. Always worked.. She called it Brittle & it has chopped walnuts sprinkled on the top right after spreading the melted chocolate chips.. Delicious. Would toasted coconut make a good sprinkle? That looks Devine!! Thanks for the recipe! This was delicious!! Just made today…not sharing. Lol thanks for a different recipe. Love it. Has anyone made this with vegan butter? I’m testing it now using earth balance. Did the vegan butter work? I have been making this for years thanks to Trisha Yearwood’s recipe. Glad to see a simple recipe that tastes good is making the rounds again. One quick note… I spray a spatula lightly with Pam (or whatever you use) before I spread the chocolate and it works much better than the bare spatula. Just a thought. I have made this several times since I first made I t for Christmas. Recently my daughter and I decided to use white chocolate chips and it was delicious. In fact we both like i better than the milk chocolate. I made it and it is great. I also made a batch using peanut butter chips instead of the chocolate and it is every bit as good. It kind of tastes like the inside of a Payday! Salted parted up or down? Down Ofelia – hope that helps! Yikes….I put in the oven at 400 degrees, set the timer for 5 minutes and within 3 minutes smoke was pouring out of my oven!!!! It was burning….help…what went wrong. I use graham crackers instead of saltines and milk chocolate chips! Delicious!! Use a single layer of mini pretzels instead. YUMMY! That sounds fantastic Kimberly – thanks for sharing! Would it work to use parchment paper instead of foil? This looks wonderful. I think you could Kim – enjoy! I’m confused by the picture. It looks like you used 1/2 cup of butter, but the recipe calls for 1 cup. I’m chuckling at the negative reviews. Dont blame the recipe, try it again and figure out what eent wrong! My Mom made this when I was a child, it’s inexpensive and delicious. Funny how I didn’t know how poor we were till I got older. I had a wonderful Mom who had a bag of tricks to keep us happy and healthy. One of those tricks applies to this recipe. Brown sugar! I have a love/hate relationship with brown sugar. Love the taste and cooking with it, hate trying to store it and keep it soft or soften it when that fails and it goes hard as a rock. Enter Mom’s secret: don’t store it! Make it as you need it! Brown sugar is simply 1 tablespoon molasses mixed with 1 cup of granulated sugar. Molasses stores practically forever, so keep it on hand and you can quickly make all the fresh, soft brown sugar you need for whatever recipe calls for it. Love it! Thanks for the recipe. Followed it and it is flawless and yummy. My presentation may not be perfect but the taste is. I made this I thought it was the easiest thing ever. You just do exactly what it says mix your butter and brown sugar stirring it constantly, once it’s boiling keep it at a medium boil for exactly e -4 minutes, I put my crackers on a cookie sheet covered with the heavy foil, buttered lightly. I poured the toffee on the crackers put in 350 degree oven for 5 min. Took it out, sprinkled my choc. Chips all over put in oven that was shut off for 2 min. Took it out with a Rachel Ray spatula (I can’t think of material at the moment) I spread the chocolate chips , they went smoothly, and I sprinkled a crushed up Heath bar around, I put pan in freezer for a bit, and I melted a nestle white cookies & cream chocolate bar in microwave and when I took it out of freezer I drizzled it around.let it set a few seconds and mine lifted up off pan in one big bar, I just snapped it up in pieces I thought it looked better all different ways. I put it in little metal containers with tissue paper for my partner to take to his family’s Xmas party, I wasn’t feeling well,it was a hit. But I just had crumbs, so tonight my granddaughters and I are making it while I babysit for New Years eve! It’ll be all ours! Of course I didn’t tell them it’s xmas crack, but they want popcorn too, I’m thinking they will go good together! Happy New Years all! I made this for the 1sr time today. Super easy. Great it truly only takes 10-15 min start to finish. I used salted saltine crackers and salted butter. I put in in the oven for 5 mins and took it out and poured my chocolate chips on and it was super easy to spread. I know they will not last long. Here’s my Togo to recipe when craving a salty sweet snack excellent recipe. These instructions were so easy to follow thanks to the attached video. Made a batch for the big game viewing party tonight to do in my SnackStadium. I used nonstick aluminum foil and had no release problems at all. Thanks for all of the tips that you and the other commenters included. If you use ritz crackers, being round and not square, does this work just as well or wld. the square crackers work better? I think they wouldn’t cover the bottom of the cookie sheet easily so it may not cook as evenly Bonnie? Would love to hear other folks suggestions! Mine turned out terrible. Never got hard and crunchy. Threw all of it in garbage. Waste! !